The Boeotia Survey in Greece is widely recognised as a milestone in Mediterranean landscape archaeology in the sophistication and rigour of its methodologies, and in the scale of the 25-year investigation. This first volume of the project's publication deals with the landscape that formed part of the territory of the ancient city of Thespiai. This landscape acted as the laboratory in which the project refined its methodology: the entire territory was traversed systematically by survey teams, and artefacts were collected not only from every archaeological site located but also as 'off-site' material indicative of land use practices such as manuring. 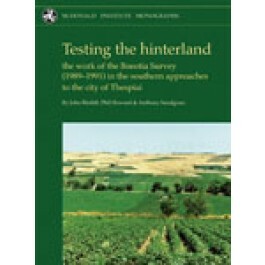 The methodology made possible the construction of detailed period and density maps of rural activity, throwing unprecedented light on the interaction of the city with its hinterland particularly in its period of maximum size between the 5th century BC and the 6th century AD, as well as providing an exemplar for Mediterranean landscape archaeology more generally.